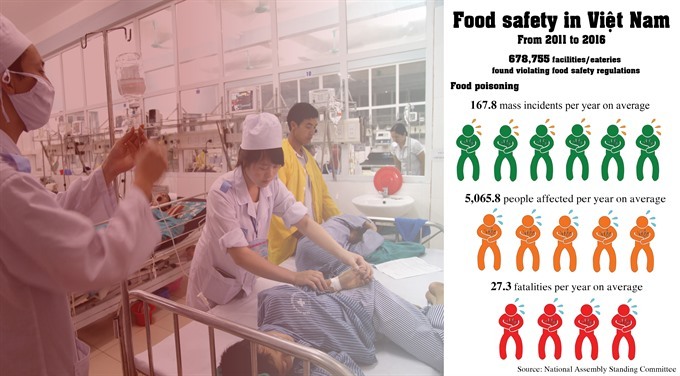 HÀ NỘI — Measures to ensure food safety were a hot debate topic in the National Assembly yesterday, as NA deputies spent the whole day reviewing the implementation of food safety laws and regulations from 2011-2016. A report released by the National Assembly Steering Committee shows food safety violations have remained a grave issue over the past years, despite increasing inspections by authorised agencies. According to the report, among the 3.35 million food producing and trading facilities/eateries inspected across the country in the five-year period, more than 678,000 establishments, or 20.2 per cent, were found to commit violations. The period saw an average of more than 5,000 people suffering from food poisoning per year, while seven types of foodborne diseases, resulting in more than 4 million cases and 123 fatalities, were recorded. The consumption of unsafe food constituted a reason for the rapidly rising number of cancer patients, which kills about 70,000 people per year. The report points out that State management to ensure safety of vegetables, fresh meat, animal produce and livestock slaughter remains weak. Authorised agencies still fall short of monitoring the process of food processing and sales, making it hard to control safety standards. Some officials failed to perform their tasks properly, because of irresoluteness or corruption. As the first deputy to voice opinions after listening to the report, Nguyễn Hoàng Mai, from Tiền Giang Province, said the number was just "the tip of the iceberg", citing an even more alarming figure. "I am sure that there must be millions of diarrhea cases every year. It is not recorded, because people often seek self-treatment at home instead of going to the hospital," Mai said, adding that many people are growing vegetables or raising livestock for food as a self-protection measure, whereas many others are "leaving their health and life for luck and fate." He proposed to add safe production as a new obligatory criterion for a locality to be recognised as a new-style rural area, as well as part of the regulations in each village. He also suggested setting up a food safety hotline so that people can easily report food safety violations. Deputy Nguyễn Mạnh Cường from Quảng Bình concurred, stressing that the people are the best supervisors and should be given good conditions to report such violations. At the moment, they do not know where to do so, while the reporting procedure is complicated and the mechanism to protect whistleblowers is not effective, he said. Deputy Phạm Trọng Nhân from Bình Dương noted that numerous hazardous chemicals or banned substances used in food processing are still available in the market without control. He said an average of 100,000 tonnes of pesticides and other crop protection chemicals, the use of which repeatedly raises public concern, are imported to Việt Nam every year, while an unmeasurable amount is still illegally imported. "Is it exaggerated to say that we are self-poisoning?," he asked. Under current laws, most food safety violations are only subject to administrative fines. Deputies also lamented the overlapping role of the three ministries involved in the issue, which are Ministry of Agriculture and Rural Development, Ministry of Health and Ministry of Industry and Trade, making it hard to monitor legal implementation on the issue.